I picked up some serious hardware this weekend. My goal of nearly 40 miles over two days went off pretty much as planned and today, while not as spry as usual, I'm feeling ok. My calves are probably complaining the most, but my energy is good. First off, check out these cool finishing medals! On Saturday, I ran the Bad Bass trail Half Marathon. My goal of 2:00 was just missed at 2:01. The terrain was a great mix of loose and hard dirt and featured numerous ups and downs. I found the downs the trickiest part as it was so, so easy to sprint them. However, knowing that the SF marathon the next day would feature a fairly hilly first half, blasting my quads to pick up a few more seconds seemed stupid. So, with every trick I knew, I focused on taking the hills in an easy manner. My goal was to use the gravity assist to let my heart rate decrease from the strain going up the previous hill. And speaking of previous hills, I have learned in my ultramarathon running that you pretty much walk the steep bits. Everyone on Saturday - even in a half - was doing this. The difference in speed in walking and running them is negligible, but the savings in exhaustion is huge. I suppose the best and speediest of ultra runners do run them, but that's why they win medals and belt buckles. I found that shortening my stride, keeping on my toes a bit and just plain holding back worked. And in fact today, after the two races, my quads feel pretty good. The race itself was beautiful. We traversed lovely hills above Oakland and a lake/reservoir. Finding the location was easy (I was an hour early so no stress there). Temps were in the 60's. The race staff was on top of it, and everything really just went well. I had some nice chats with other runners along the way, and they had a great selection of food and treats. I did also find the race director and ask why "Bad Bass?" (See my previous post for the confusion.) It turns out there is no real reason. The lake has bass in it. And when he started this race (he puts on 20 different ones a year), he just picked Bad Bass. He sort of does not like it, but he feels compelled to keep it. Frankly, I think this finishing medal is the coolest of the three. There is a Scottish Tartan thing to these guys too - they all had some sort of tartan clothing, and the race shirt had a subtle pattern to it. The women all had tartan skirts on. Brazen Racing is the organization, and if you are in the Bay Area, I recommend their events. Briefly on the subject of food, eating well for races like this is important. On Friday, when I arrived at my hotel, I went out to the Ferry Market across the street and bought a number of fresh and organic fruits, smoked salmon, prosciutto and a gluten-free, organic challah. Instead of ordering room service, I munched on these. Then on Saturday night, I was treated to a mini feast by my college roommate's wife Marsha and their daughter Annalisa. So, I was well fueled to run and burn up those good calories. Sunday did not so much dawn as jump start. About midnight, I heard the ultra marathon start, and then starting about 4 AM, there were enough noise coming from outside my room and the starting area to wake me. One of the amazing things about staying above the start line is that you can take your own sweet time getting outside. I left my hotel and dropped down the stairs besides my room at 5:22 for my 5:42 start. About 10 minutes were needed to walk to the starting corral for wave 3. Being able to emerge without needing to drop any stuff in the bag drop also helped speed up the process. The race started on time, and I took off at a reasonable 9 min pace. My goal for the first half was to run intervals of about 8:30's per mile with 1 minute walk breaks every 3-4 miles. This would put my average up around 8:50 or so. Happily, that is almost exactly what I did, and after a marvelous crossing of the Golden Gate Bridge (twice - once in each direction), I passed halfway in 1 hour 56 minutes. The weather remained in the 50's with overcast skies and light winds. While not recommended for sightseeing, this was great for running. I ran with and by a number of fellow Marathon Maniacs which is always fun. One fellow runner is doing Pike's Peak in 3 weeks. That's a race to the top and then back down. Crazy! But on my runner's bucket list for sure. Having come off the steep course on Saturday, I was particularly careful not to zoom down the area after the bridge which drops quickly over just a few miles. People kept flying by me, but I am happy enough that come the second half, I don't think I was passed other than during my walk breaks. Crossing the finishing line, I was treated to a strawberry and banana smoothie. Yum! In fact, back to food, I pretty much laid off the food during the second half of the run. I carry GUs and Clif Blok's, and I think between Saturday and the first half of Sunday, my stomach called "enough" of the processed carbs. That is something to watch out for on the 50 miler. My stomach was not that horrible during the race, but I definitely knew it was there. I sipped the cool drink as I collected my finisher medal and then my LA/SF Challenge medal (both pictured above). The marathon website reports my time as 3:48:56. This is my 13th marathon or longer in just over 9 months. I've run Chile, New York, China, California (7x), North Dakota, Niagara Canada and London. Believe me, there are lots of people doing more, so I am not measuring myself against them. This weekend though showed I had enough to run two decent races back-to-back. I'm not sure I want to do this often - in fact I will try it just one more time before the JFK 50. I am more sore than usual after a marathon; I ran one 2 weeks ago for example and was sort of unfazed after I was finished. That was a trail one and my slowest marathon yet, so I am sure that helped. During Sunday's race, various muscles would complain from time-to-time. That would be my signal to change my stride a bit, make sure I was using good posture or time to just take a walk break. My mind was being very methodical in listening, and that is good. 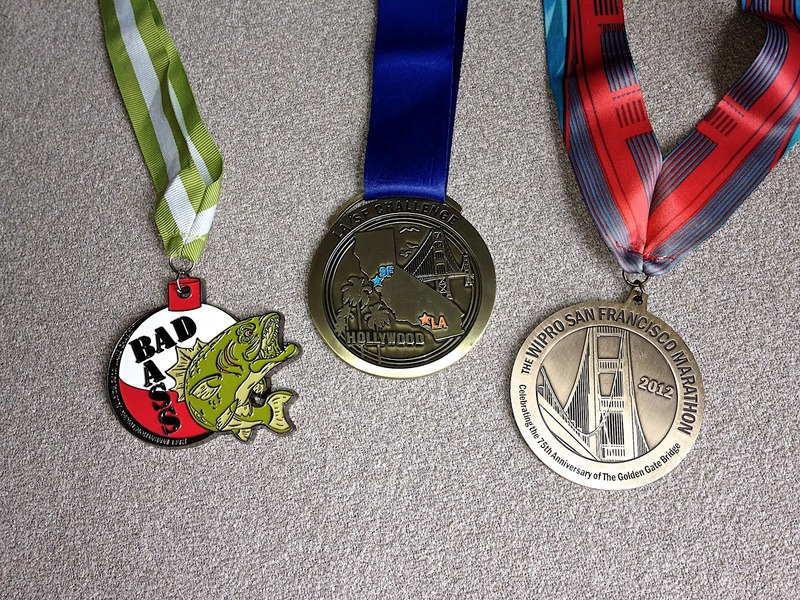 Should I have run the SF marathon slower - like maybe 5 minutes slower - or about 20 seconds per mile? About that, I am not sure. Biomechanically, I like running around 8 mins per mile. Without thinking about it, I will gravitate to around there. Numerous times in the race, I had to slow myself from the high 7's. This presents some interesting challenges for the 50 miles. How in the world can I plan to run that speed deep into 50 miles? I just don't know. I will try two things going forward. First, I need to get comfortable running at 9 - 9:30 pace. That will take some work. Second, I will continue to focus on walk breaks to keep me fresh. The rule in a long run is to start slow and then taper from there! All-in-all, this weekend was a success for me and very fun, and I look forward to the next challenge on the road to the JFK 50 - a 35 mile run in 3 weeks in New Jersey. Looking good at the end of the Bad Bass half. Will I feel this way after 50 miles?